As we seek solutions to the frequently complex biomechanical puzzles posed by those who consult us, Tom Myers' insight into the fascial networks of the body can often point to practical therapeutic options. The Anatomy Trains metaphor is a revelation; a way of seeing the body's interconnectedness more clearly, offering new physiological and anatomical perspectives, and therefore different clinical choices. Quite simply the content of this book is revolutionary.? Leon Chaitow ND DO, Honorary Fellow, University of Westminster, Editor-in-Chief, Journal of Bodywork & Movement Therapies? Any body of work that demonstrates the interconnectedness of the body and fosters appreciation of the whole over the sum of available parts is a must in today's health and fitness market. Anatomy Trains champions a wider scope of the body and its movement systems. Gray Cook MSPT, OSPT, CSCS, Developer of the Functional Movement Screen Tom Myers' masterful second edition of Anatomy Trains incorporates the most recent scientific concepts into a framework for understanding and practicing deep tissue work. Readers will gain insight into both basic and clinical research issues, how the science could influence clinical practice, and vice versa. Completely redone illustrations show anatomy from the cellular to the whole body level, describing both structure and function. Clinicians, researchers and educators alike will find this an invaluable text, which leads to new insights on each reading. Dr Andrea Coates Vinson, D.C. Anatomy Trains has become required reading for the advanced Structural Integration and Myofascial Therapy programs of the CORE Institute. Myers has discovered the critical interconnections of the myofascial web and communicates his vision in a language that honors both the art and science of somatic therapies. George P. Kousaleos, LMT, Founder & President, CORE Institute For everyone interested in integrative medicine and functional anatomy, this artistic book is recommended. It even makes studying functional anatomy enjoyable. Dr Andry Vleeming, Professor of Clinical Anatomy, co-editor of Movement, Stability and Lumbopelvic Pain The beauty of Tom Myers' work is that it is useful for a wide range of bodyworkers, from movement or energy therapists to manipulative manual specialists, and does more than simply demonstrating rote techniques, Anatomy Trains provides a deep understanding of strain patterns in the body to enable creative and effective solutions for the issues we encounter in a bodywork practice. Art Riggs, Certified Advanced Rolfer Our field is fortunate to have the talent and skill of Tom Myers and his ability to articulate his findings. His study, discoveries and syntheses are clearly defined and easily applicable for anyone who works with the body. His documentation of the body's structure and function containing spiral pathways inspire people to rethink the idea of 'straight line' movement. Judith Aston, M.F.A. Somatic Pioneer teaching bodywork, movement, and fitness for over 40 years. Anatomy Trains will help physicians, therapists and bodyworkers of all backgrounds break away from the prevalent traditional, mechanistic view of how the body works and is to be treated and will then push you headfirst into a logical, systems oriented view that has helped expand my diagnostic and treatment paradigms as well as my personal practice enormously. Chris Frederick, Physical Therapist, Certified Flexibility Specialist, Professional Structural Integrator, Director Stretch to Win Institute. Training optimal movement patterns requires an understanding of how the body regions connect and work in synergy. Anatomy Trains is an essential guide for understanding key myofascial lines which, when in tensegrity, facilitate optimal movement and postural patterns. Keep the train rolling, Tom. All aboard everyone! Diane Lee BSR MCPA FCAMT, physiotherapist and author of The Pelvic Girdle Perfection improved? Guess so.The Anatomy Trains' ZenMaster once again demonstrates how excellence evolves with greater mastery as we journey the road less traveled. An anatomical playwright, Tom's newest offering captures our curiosity with incomparable biomechanical prose and delights our visual senses via breathtaking graphic designs. Kudos, Captain Myers. Erik Dalton, Ph.D. Author of Myoskeletal Alignment Techniques? Anatomy Trains revolutionizes the teaching and learning of Pilates. Elizabeth Larkam, Director, Pilates & Beyond, San Francisco In Russia, this book turns a new page in rehabilitation, osteopathy, orthopaedics, sport medicine and sports. It opens a new horizon in understanding the basics of movement patterns and posture and gives a unique chance to gain awareness of formation of scoliosis and movement stereotypes. Anatomy Trains will allow you to make quality changes in your medical and sports practices to achieve amazing results very rapidly. I am recommending this book to friends and colleagues and keep using the concepts of Anatomy Trains in my everyday practice with great success. Dmitriy Merkulov, D.O. There is no doubt that this beautiful and inspiring book will contribute many important insights to the scientific understanding of musculoskeletal function.? Helene M. Langevin MD, Research Associate Professor, Departments of Neurology, Orthopaedics and Rehabilitation, University of Vermont Tom's Anatomy Trains book and in depth practical studies represent/reveal an invaluable and vivid insight/understanding into how the body has pre-organized its movement functions via the flexible fabric (cut on the bias) from within. The story and strategies of the body's movement and the related posture is visually introduced with a wealth of "functional" information. This body of work profoundly contributes to the foundation of my teachings. It is the manual/handbook for any serious teacher or student of movement.? Marie-Jose Blom Lawrence, Master Teacher of Pilates, Director Long Beach Dance Conditioning, Creator of Smart Spine Back Support System Anatomy Trains is a resource that gives inspiration for anyone who works with the human organism, for practitioners of various manual fields, for movement teachers and for educators in a larger sense. This book is written in a way, that it leads directly into practical application. Peter Schwind, Ph.D. Author of Fascial and Membrane Technique An excellent teaching/study aid for all bodyworkers. An unusually interesting guide to living anatomy - an excellent way to visualize the anatomy of movement. Highly recommended! Rosemary Feitis DO. 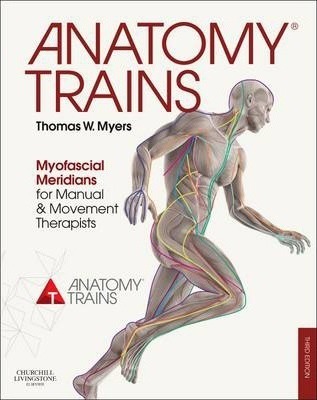 Author of The Endless Web As a movement professional it is essential to study the brilliance of anatomist Tom Myers in Anatomy Trains. When you actually see the connectedness and order of the body you begin to understand how one action can move through and effect so many others areas. Bravo!? Thomas Myers studied directly with Drs. Ida Rolf, Moshe Feldenkrais, and Buckminster Fuller, and a variety of movement and manual therapy leaders. His work is influenced by cranial, visceral, and intrinsic movement studies he made with European schools of osteopathy. An inveterate traveller, Tom has practiced integrative manual therapy for over 30 years in a variety of clinical and cultural settings, including 10 years in London, and practices in Hamburg, Rome, Nairobi, and Sydney, as well as a dozen locales in the US. He is a founding member of the International Association of Structural Integrators (IASI). Author of Anatomy Trains and a set of supporting videos, and co-author of Fascial Release for Structural Balance (Lotus, 2010), Tom has also penned over 60 articles for trade magazines and journals on anatomy, soft tissue manipulation, and the social scourge of somatic alienation and loss of reliance on kinaesthetic intelligence. A certified Touch-in-Parenting instructor, Tom retains a strong interest in perinatal issues. Living on the coast of Maine, Tom and his faculty conduct professional certification and continuing education courses worldwide.